There are four major factors, known as "The 4 C's" to consider when determining a diamond's value and pricing it. Once you understand them, it will be easier for you to choose the diamond you want. Refers to a diamond's weight. The weight of a diamond is expressed in carats, when, 1 carat equals 0.20 grams. One carat is divided into 100 points, meaning a quarter of a carat is 25 points. Most people compare carat weight to size. The larger a diamond is, the more it weighs. When mining the diamonds it is far rarer to find a big diamond than small ones, therefore, the higher the carat weight is, the higher the price is. 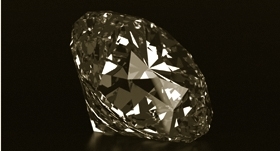 Refers to a diamond's proportions, symmetry and polish. The cut of a diamond has a large effect on its appearance, the higher the quality of a diamond's cut is the more it will sparkle. Based on mathematical formulas, an ideal cut diamond will reflect light from one facet to another and will disperse trough it's top, resulting in a magnificent display of brilliance and fire. Diamond color has a significant impact on its value. The color is ranged in alphabetical order from D to Z, with D being colorless and the most expensive, going down to Z which is light yellow. G-H: Very near colorless, slightly detectable only when compared to better color graded diamonds. I-J: Near colorless, slightly detectable. Refers to the degree to which a diamond is clean and clear. Diamonds that are absolutely clean are the rarest and therefore the most expensive. Most diamonds contain natural flaws such as traces of minerals trapped inside the diamond. They may look like tiny crystals, clouds or feathers. These flaws detract from the diamond's value, purity and beauty. Fancy colored diamonds come in colors such as blue, green, yellow, pink, purple, a combination of these colors, and more. They are exceedingly rare and highly valued. They are graded in a different color scale than white diamonds (D to Z), since the scale above ranges from the best to the worst quality in a white diamond. The yellow color in a fancy-yellow diamond cannot be found on this scale. The intensity of these colors is important. The more intense the color, the more valuable the diamond. Fluorescent diamonds come in any color, from colorless to fancy. When we are referring to the fluorescence of a diamond, we mean its ability to fluoresce in a certain color (usually blue) under the influence of ultraviolet (UV) light. When exposed to UV light, the energy level of some of the diamond’s atoms rises for a short period of time causing it to discharge this energy. This energy discharge comes in a fluorescent form. Although fluorescence is a characteristic that can be measured, it is seldom an issue when selecting a diamond. The fluorescent of a diamond is rated by the intensity of its glow ranging from: none, faint, medium, strong to very strong.